Winning Your Audiences. Movie Marketing in the Connected World is an e-book recently published by Gruvi which discusses why it’s so important to understand your audiences. This will help you to figure out how to meaningfully reach and communicate to them and what to measure so you have a clear picture of how your campaigns are performing. The book is packed full of case studies and useful insights into creative, communication, targeting, and which channels to use and when. Winning Your Audiences. Movie Marketing in the Connected World is available as a free download on the Gruvi website. Below you can read an excerpt from the book. Starting with the right question: who is my audience? If you don’t know who your audience is, then you will never meaningfully reach them. Anyone who has read Stradella Road’s interesting research on moviegoers understands that the behaviour of going to the cinema is highly complex and deeply stage of life dependent. It’s also a profoundly socially motivated activity, from choosing the movies we decide to watch, through to who we select to go with. Seven years later, it’s still a very profound study. It highlights the importance of adapting your marketing and your messaging based on your audience’s key socio economic influences. For example, here are two audience profiles modeled from their sample of 4000 moviegoers in the USA in 2010. Understanding your potential audience is very important, as it will form the basis of your strategy. Demographics are important, but even more so is behaviour. 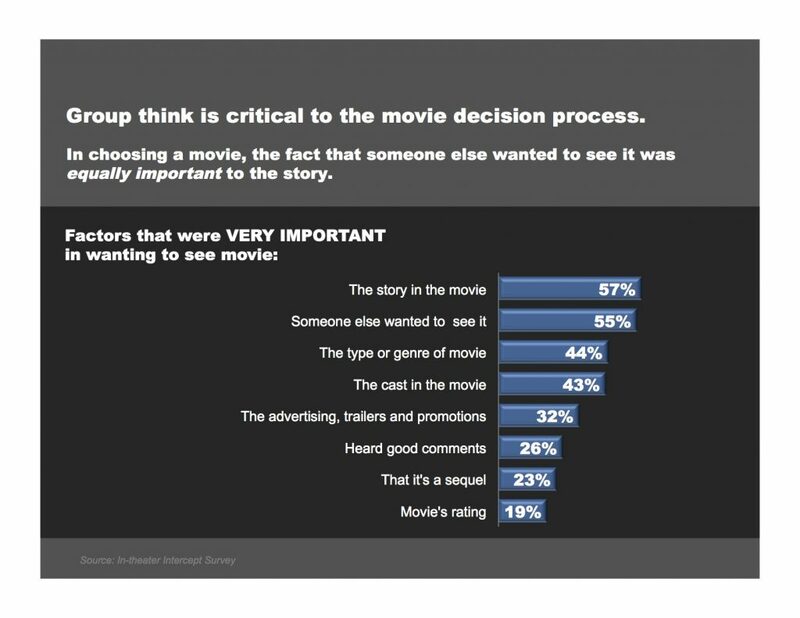 What we decide to see as movie goers and how we decide what to watch is highly influenced by what the other people want to see in the groups we go with. • 46% of moviegoers found in theaters were attending in groups of 3+. 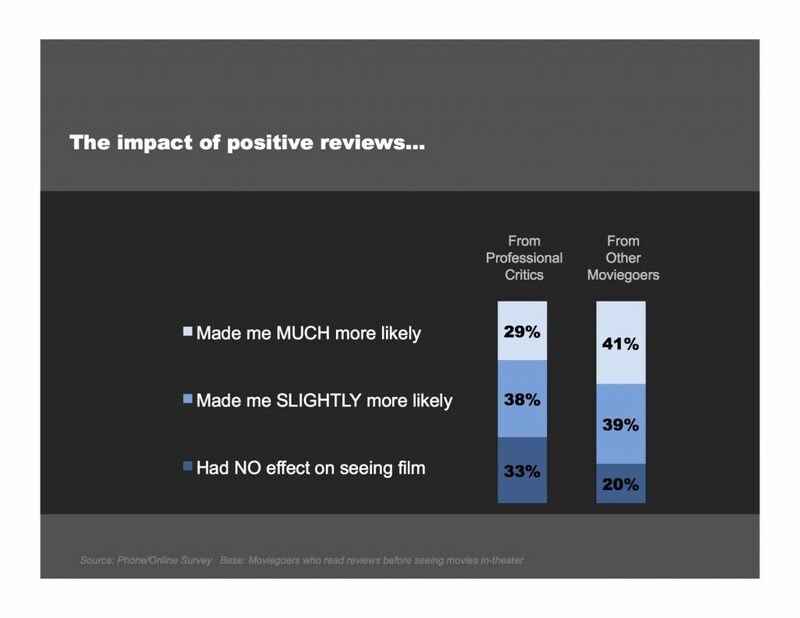 And because 75% of moviegoers trust the opinions of friends, these comments and opinions are incredibly important in the decision making process. Word of mouth recommendations from friends are very important when it comes down to choosing a movie to watch. 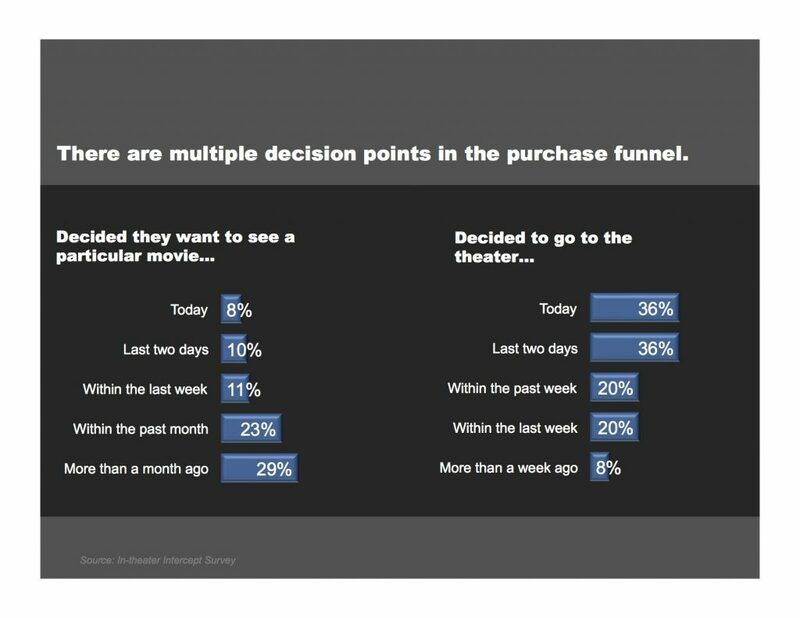 What’s also interesting is that moviegoers often mentally plan what to go see in a cinema well in advance of actually going (29% of respondents said they ponder this more than a month before the movie releases). This implies that a good marketing campaign can work to seed the notion in the moviegoer’s head that they should check out your film. However, the actual behaviour of attending the cinema is relatively spontaneous (decided within 2 days, say 72%). Once we actually go to the cinema, what we choose to watch is largely guided by the people we are with (55% of the time). Your audience is complex; it is made up of different groups of people with different desires, interests and motivations that guide their behaviour. Not only do you have to contend with that, you also have to factor in that they are highly socially influenced; deciding to see your movie or not will be impacted (at least 50% of the time) by the other people in the group. We are not as free as we would like to think when it comes to the process of selecting movies. In today’s connected world our attention spans have been shortened through our many touch points with technology. Deciding to see your movie implies a risk of valuable time and the possibility of being disappointed on the part of your audience- it’s this sense of risk that you have to overcome in your marketing. • Your audiences are overwhelmed: competition for their attention is fierce. As anyone who has been presented with an iTunes or Netflix wall of content knows, too much choice can be paralysing, leading to anxiety which in turn leads to task abandonment. Humans have evolved to avoid chaos, so more than 3 clearly distinct choices can lead to analysis paralysis or buyer’s regret. An important step when you have identified your audience should be to provide a very compelling WHY- why they should risk their time to see your film? Good marketing focuses on the WHY and appeals to meaning, rather than attributes. For a crash course in ‘WHY’ and WHY getting your ‘WHY’ right is so important, watch Simon Sinek in his TED talk. Remember: If you don’t win the war on chatter within the right audience group, your film runs the huge risk of not being relevant. Chatter is the endless essays, comments, opinions, debates and conversations that people should be having about your film. We often hear independent filmmakers and distributors expressing fears that the audience for their films is ‘too small’. While it is true that some movies appeal to a niche audience, it doesn’t have to be seen as a disadvantage. That, combined with a limited release, can go a long way in creating a buzz about the film. The flexibility of digital marketing makes it an excellent way to reach small, niche audience groups. It’s also a wonderful tool for broad reach and for being pervasive across devices and online experience. 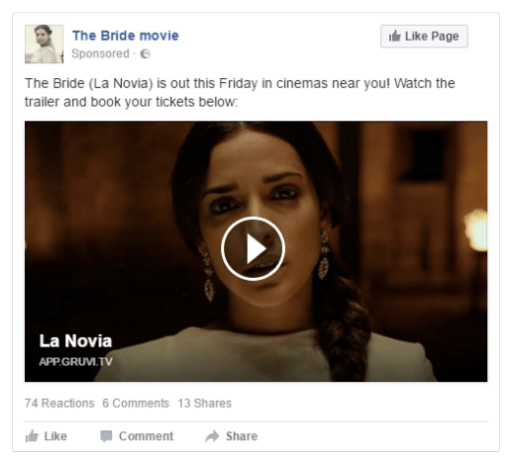 In August 2016 Gruvi ran a social media campaign for the limited US release of the film The Bride (dir. Paula Ortiz). The film was distributed in the US by Outsider Pictures. It premiered on August 5 in 3 cities in Florida- Hollywood, Fort Lauderdale and Miami. The goal was to target and engage the Spanish-speaking community in Florida during a one week campaign (August 3 – August 8). We refined the targeting by focusing on fans of foreign art-house movies (e.g. Embrace of the Serpent, Son of Saul) and directors (e.g. Pedro Almodovar and Wong Kar Wai.) The key media used for the campaign included Facebook and video pre-roll on YouTube. The total budget was of 1000 USD. We tested the interests we identified (similar movies, directors) to identify the key demographics of the target audience. This revealed a particularly high engagement from males and females over the age of 55, with particularly good results for females older than 65. The targeting in the main campaign then focused on these groups. The results confirmed the outcome of the testing. While the testing produced an average clickthrough rate of 2.41%, this went up to almost 4% during the campaign. An excellent result when factoring in that the average CTR for Facebook ads in the US is as low as 0.98%. Users in the 55+ category accounted for the highest clickthrough rate (5.60% for female users and 3.82% for males). They were also more likely to watch more of the trailer. Another demographic group turned out to be very engaged with the content- the clickthrough rate for young women (25 to 34 years old) was over 6%. In total we reached 94070 people and generated over 38000 actions (including video views, clicks, likes, comments, shares). The film went on to perform well in these three locations.